Who Has Pewter Ssr Display? I won #388 at the Lansing homecoming show. I don't have one either--where do you get them? How many are there? I meant to get the number off mine last night. Why not edit your first post adding a list that you can add in numerical order each number as it is posted, i.e. There seem to be no rhyme or reason for the way they were given out. Marc , Scott and I got ours way back in 2004 at the same time but our numbers arn't even close to each other. There seems to be no rhyme or reason for the way they were given out. Marc , Scott and I got ours way back in 2004 at the same time but our numbers arn't even close to each other. According to Bob Walzcyk mine was given out to me because it was similar to my VIN # in that the last two numbers 9684 & 384 where the same. I know one of our members rick418cars (he rarely visits nowadays) also recieved one as an award at the Lansing Homecoming show. I don't know if he still has it or if he sent it with the Americano when it left for Cali with the collector. Deb, set up an auto-search on eBay. You never know what might show up. 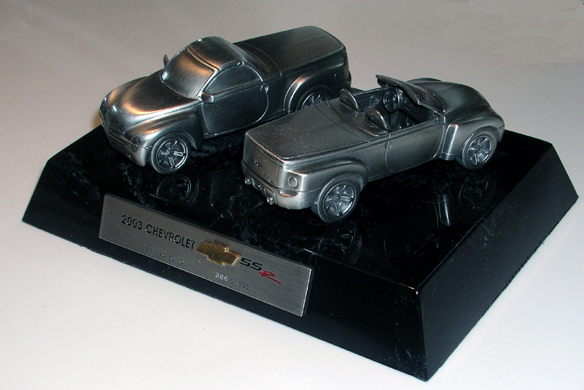 2003 Chevy SSR Plaque desktop display signature series:eBay Motors (item 300371963250 end time Nov-28-09 17:26:54 PST). This one (#73) sold on November 28th--seller closed the auction before it went no more than about a day. I'm thinking they got an offer and sold early to grab the cash. Although it looks like there were no bids, click on the "0 bids", then scroll down and you'll see that there was one for $125.09 that was cancelled when the seller ended the auction. I watched this and the $125.09 had not met the reserve price. Although it looks like there were no bids, click on the "0 bids", then scroll down and you'll see that there was one for bid of $125.09 that was cancelled when the seller ended the auction. I watched this and the $125.09 had not met the reserve price. It would be interesting to find out the selling price. Let me know if #12 ever shows up on EBay. I'll let you know if #23 shows up. 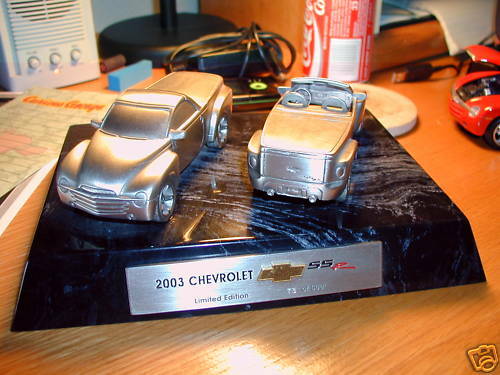 THESE WERE ORIGINALITY MADE AS A AWARD FOR CHEVROLET DEALERS IN 2003,THEY CAME WITH A LETTER FROM GM.THE DEALER I WORK FOR GOT ONE BUT WOULD NOT LET ME HAVE IT.I DID BUY ONE FROM A ANOTHER DEALER LATER AND ONE FROM MEMBER RICK418CARS. So... now we know where Rick's went. IT WAS FOR SALES PERFORMANCE FOR A PERIOD OF TIME IN 2003.THE DEALER HAD TO MEET DIFFERENT QUOTAS TO WIN. Is that the SSR Sets The Pace Posters? I could look after that if it is the one you are referring to and we want it. I have #44 and #333. Whatever, I'll just start it and see if anybody cares! I think Keith is talking about the Concept poster - there was a limited run of 500, numbered and signed by the engineers. I kinda thought it was something different from the sets the pace but I didn't think there were 500 of the others. I thought the others were much more rare. Didn't Sandy (turnheadz) bid and get one of those about a year ago? Oh well, now there's a thread for the Sets the Pace posters too. Sandy got the original Artist's proof of the Set the Pace poster.